I hate beer. I always try to drink it, or taste new ones that Andre gets, and I even enjoy going to a brewery, and will drink the free beer they give you, but I really do not like the taste of beer. I'm a girl's girl with my alcohol. I mostly drink white wine...moscato to be exact. Or I will give something new a try every now and again. But the drink I really enjoy (besides the moscato, of course) is a hard cider. I haven't met a hard cider I didn't like. Redd's, Strongbow, Angry Orchard - I like them all. I will order whatever cider's on tap, or buy whatever's cheapest at the grocery store. I can only imagine a day when I buy an expensive cider. 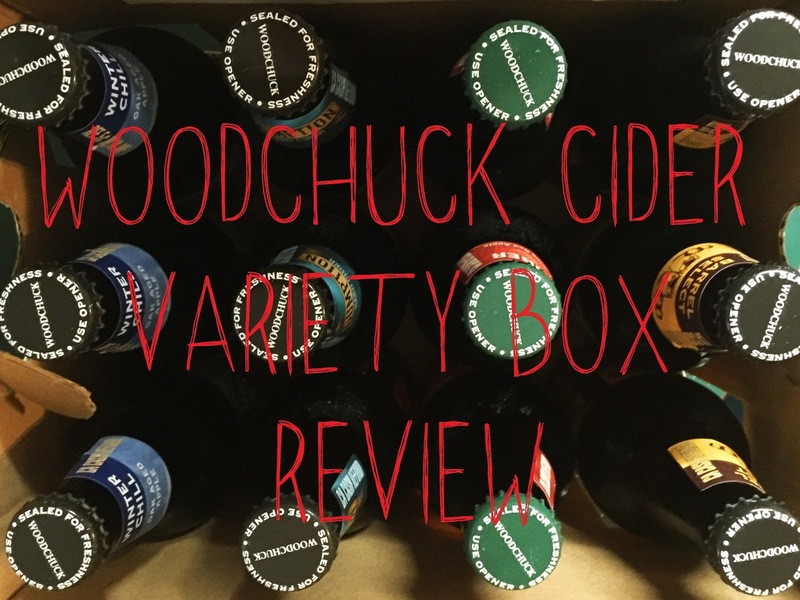 Usually, I'll buy the 6-pack or single cans, but I took a leap recently and bought the 12 bottle variety pack from Woodchuck - the Cluster Chuck (how funny, right?). The box included three bottles of each of the four types of cider - original (Amber), seasonal (one of the four seasons), limited edition (self-explanatory), and Chuck's choice (can be anything from the private reserves to a new style). Chuck's Choice- Barrel Select. (6.9%) The one was strong. Not apple strong, but alcohol strong. This one tasted a lot like a dark beer with just a hint of apple. I wasn't a huge fan, but I was able to drink it. I just wouldn't personally pick this one in the future. Limited Edition- Gumption, (5.5%) based off P.T. Barnum. This one was hand's down my favorite. Andre hated it. It's described as a mixture of dry cider apples and common eating apples, and I can definitely taste that there. I didn't think it was too sweet. It was a perfect balance, and I would drink this one over and over. Seasonal- Winter Chill, (5%) dark aged apple. I was able to drink this one pretty quickly. It was a very subtle cider with light hints of apple. It almost tasted watered down it was so subtle. It tastes good, but it almost didn't taste enough. Original- Amber (5%). Obviously this one is good. It's the original. It's a perfectly sweet cider that I'll drink over and over again. Are you a cider drinker? What are you preferred brands and variations? Yes. It was nice to have a few to choose from! Hard cider is my absolute favorite, so I totally need to try this! I'm with you...I don't do beer unless it's a Corona Light with lemon and a lime, haha! I do like Redd's so maybe I would like some of these! I'm sure you would because I'm a big fan of Redd's too!